Companies rely on the data center and IT to provide mission-critical services, like e-mail, Web, and voice. However, assuring service delivery and reliability becomes increasingly difficult as growth in data center virtualization, remote access, cloud-based applications, and outsourced service technologies fuel operational complexity. 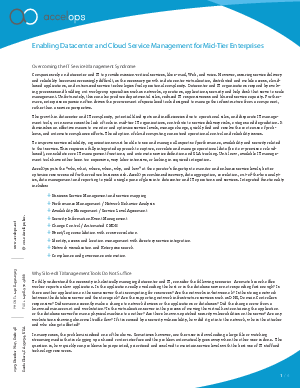 To improve service reliability, organizations must be able to see and manage all aspects of performance, availability, and security related to that service. Read this white paper to learn how the combination of discovery, data aggregation, correlation, out-of-the-box analytics, data management, and reporting can yield a single pane of glass into data center and IT operations and services.